Many members of the Mississippi State community are in conflict about Dan Mullen's return to Starkville with his first Florida team. Others know exactly how they're going to feel. STARKVILLE, Miss. 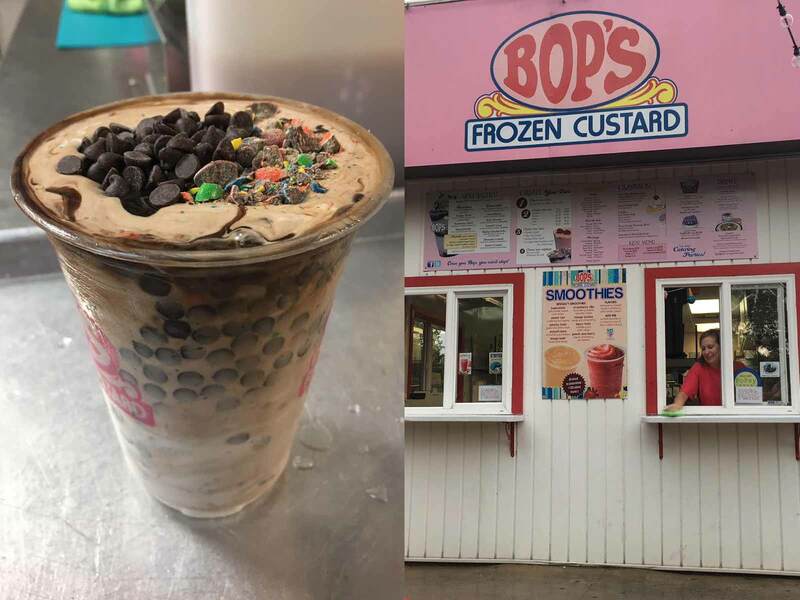 — In the spring of 2014, the Bop’s frozen custard shop announced a new item with a flyer taped to its front window. The Mullen was a vanilla concrete topped with chocolate syrup, caramel, chocolate chips and M&Ms. Mississippi State coach Dan Mullen frequented Bop’s so often and ordered the same off-menu item that employees began advertising the concoction to all customers. Turns out, The Mullen was only seasonal. “It’s now called The Lateral Move,” says owner Kay Holland, a dig at the coach for his decision in November to join SEC rival Florida after nine years at the helm of the Bulldogs. The Lateral Move, from Bop's Frozen Custard in Starkville. It’s not all about Dan. Florida athletic director Scott Stricklin came from Mississippi State, stunning the fan base of his alma mater two years ago by accepting the same job with the Gators and then enraging it by hiring away Mullen. This could be the first time in major college football history that a head coach and an athletic director, both at the same school, return to face their former employer. Longtime high-ranking officials at each of the five power conferences in college football say they’ve never heard of that happening in at least the last 30 years. “That’s pretty unique,” says Mullen himself. Each morning on his drive to the office, Mississippi State athletic director John Cohen calls one of two people: Stricklin, whom he calls a “mentor”, or Alabama athletic director Greg Byrne, another former Mississippi State AD who hired Cohen to coach the Bulldogs’ baseball team in 2008. The three men are still close from their time in Starkville—Byrne as AD, Stricklin as associate AD and Cohen as a successful baseball coach with an itch to be an administrator. In November, Cohen found himself on the phone with Stricklin, not discussing the good old days but a more serious matter: Stricklin was pursuing Cohen’s football coach. “Scott and I shared information, but he’s not going to tell me everything,” Cohen says. “If you’re asking if Dan is an option, yes Dan is an option,” Cohen remembers Stricklin telling him. Mullen became the option for Stricklin after Florida lost out to Nebraska in the race for Scott Frost and to UCLA in the pursuit of Chip Kelly. Mississippi State players gathered in the football facility for a previously scheduled afternoon meeting on the Sunday after the Bulldogs’ 31–28 Thanksgiving night loss to Ole Miss in the Egg Bowl. As they waited for coaches to arrive, the news, through social media, had already reached them. It was hard to believe, because Mullen had earlier that month told his team, “Guys, I’m not going anywhere,” according to quarterback Nick Fitzgerald. At times, Mullen’s personality was off-putting and cold, according to multiple people interviewed for this story. Even the coach himself is not oblivious to it. He told the Tampa Bay Times over the summer that he began his tenure at Mississippi State “paranoid.” In one meeting with athletic department officials at Mississippi State, Mullen once acknowledged his personality flaws, saying “that’s why I married my wife—she’s the nice one.” The coach was known for throwing barbs at opponents—namely rival Ole Miss, fanning the flames of a nasty century-old feud between schools separated by 90 miles. Then after the 2014 season, when his defensive coordinator Geoff Collins left for the same job at Florida, Mullen referred to it as a “lateral move,” the derivation of Bop’s latest item name change. 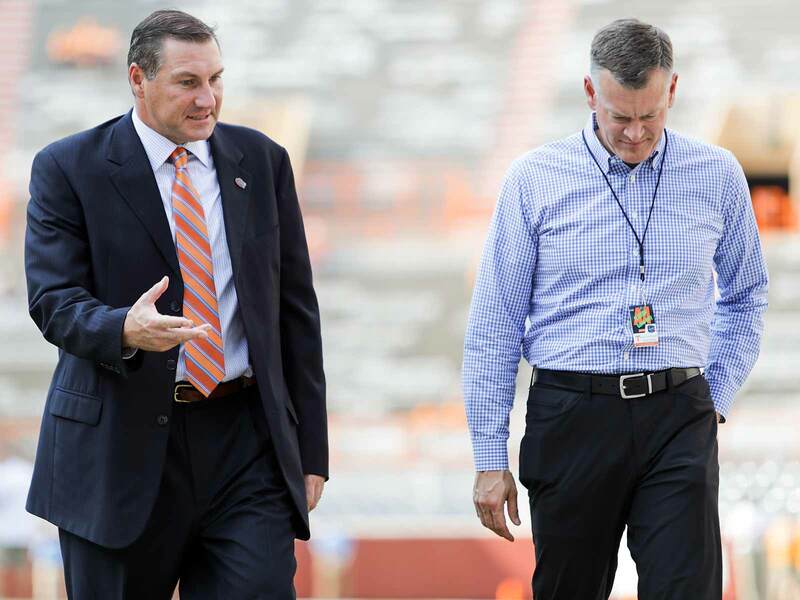 Dan Mullen and Scott Stricklin (right) were reunited in Gainesville last winter after working together in Starkville for nine years. The committee was not on the books—unlisted and unofficial. Its members numbered from eight to 12, and they met, usually, on Tuesday afternoons to do one thing: brainstorm ideas to put Mississippi State athletics on the map. “Nothing was too crazy of an idea,” says Chad Thomas, a 36-year-old who served as Mississippi State’s associate AD for marketing under Byrne and Stricklin before leaving the university in 2013. Stricklin was heavily involved in the meetings, often pushing the team to think outside of the box and elevate the Bulldogs’ branding. 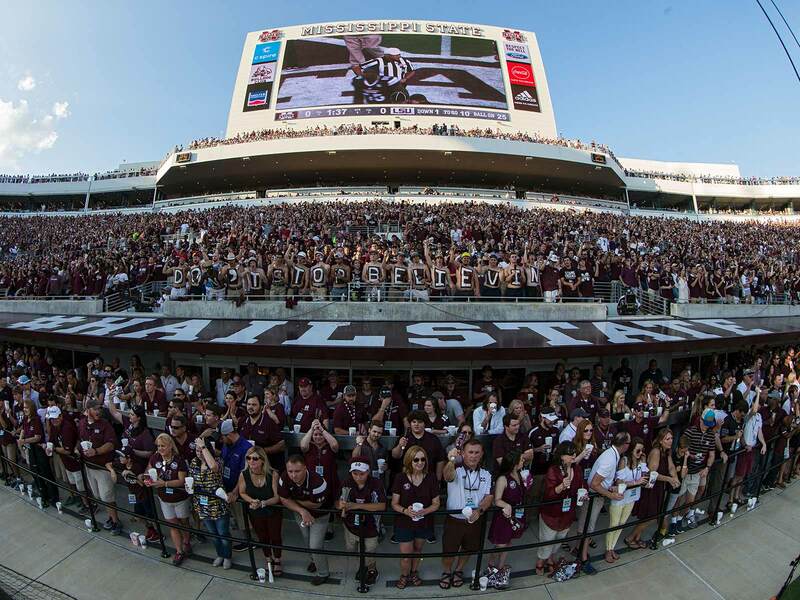 The gatherings produced many things familiar to Mississippi State fans today: the “This is Our State” billboards the erected at every major state line crossing in Mississippi; the “Spread the fun” campaign the school began upon Mullen’s offensive overhaul of Croom’s pro-style offense; and the hashtag the program painted in its end zones in 2011. “The end zones were a blank canvas, and we were going to use them,” says Joe Galbraith, now an administrator at Clemson, who was also part of the committee. Stricklin’s mark on Mississippi State is deep. He hired both current basketball coaches, Ben Howland and Vic Schaefer. Schaefer has taken the women’s team to back-to-back appearances in the national championship game, and most believe Howland’s team is poised for a breakout season. Stricklin led expansions to the football, softball and baseball stadiums, and he fought the SEC to preserve one of the school’s most cherished and unique traditions: ringing cowbells during non-action in games. Brian Hadad, a 42-year-old Mississippi State alum and who now covers the team as a radio personality, says some of Stricklin’s achievements are “marred” because of his hiring of Mullen. “This feels like he betrayed his alma mater,” Hadad says. The sleepover is Friday night in Starkville at a friend’s home. That’s where Megan Mullen, son Canon and daughter Breelyn will stay on the eve of the big game. There’s no staying at the Mullens’ old place. The $1.35 million, five-bedroom home is in the closing stages of being sold, Megan says. Plus, the kids want to catch up with friends, and so does she. “It just so happens we’ve got to go to this game afterward Saturday and watch it from different seats,” she says. The only thing she knows about the visiting coach’s suite is that it’s on the opposite side of the stadium from her usual perch above Scott Field. At times during a 20-minute phone call, Megan grows emotional. She’s been dreading this day for nearly 10 months, since her husband ended a phone call in November, walked outside to the backyard and stared at her with a look she’d never seen before. That’s when she knew he’d gotten the call. She doesn’t understand the animosity that awaits her husband in Starkville. “It’s such a shame. Listen, I’d be lying if I didn’t tell you for nine years that [another school] called every year,” she says. “I 100% believe that that’s the only call that would have taken him away from there. I hate that anybody could feel upset or mad. I think that was a dream job since he was a kid.” It’s never been made clear how many coaching jobs Dan Mullen was officially offered during his time in Starkville, but most here believe that he got the closest with Miami twice, when the Hurricanes hired Al Golden in 2011 and then Mark Richt in ’17. For Megan, the return to Starkville is “crazy dumb luck.” Mississippi State and Florida have played just twice in the previous 12 years and won’t play again until 2025. “Since the day we got this job, everybody was mentioning, ‘You get to come back for the game!’” she says. “And it’s probably a double whammy because I think we left them one of the best teams we’ve had since we were there, too.” The new coaches took over a program that they agree was ready to win, talent-wise. Moorhead lauds the job Mullen did here, describing the foundation he left as “strong” and says his goal is only to elevate it to a level in which Mississippi State competes for SEC championships and College Football Playoff spots. In Mullen’s tenure, that really only happened once, the 2014 Dak Prescott-led Bulldogs who started 9–0, rose to No. 1 and then lost three of their final four games. Mississippi State hasn’t beaten Alabama since two years before Mullen arrived. Moorhead’s title-winning plan got at least temporarily derailed last week with a 28–7 loss at Kentucky, a defeat in which the Bulldogs showed a lack of discipline that he takes the blame for. “A little part of you dies with every loss,” Moorhead says.